Editor’s note: James Altucher is an investor, programmer, author, and entrepreneur. He is Managing Director of Formula Capital and has written 6 books on investing. His latest book is I Was Blind But Now I See. You can follow him @jaltucher. I wanted to write an appeal for the Wikimedia foundation. I’m going to be completely honest with you: the only reason I wanted to write it was for completely self-promotional and ego purposes. On almost every Google search, Wikipedia is the #1 or #2 result. It’s almost like Google is just a middleman to Wikipedia. In my ideal world, for instance, you might search on “head transplants” and then click on the Wikipedia page and see my face on the left hand side with something like, “Click here to donate $5 to my favorite cause”. Who is that? One would wonder. Why is he now talking to the entire world? You might forget all about “head transplants” and realize that far more valuable information was a click away if you would just listen to my appeal to humanity for the benefit of the Wikimedia foundation. How amazing would that promotion be? All for me. When you are promoting yourself you can’t think of just, “how many SEO impressions can I get?” When the aliens invade 700 years after our apocalypse they won’t care about SEO impressions. They will care about my very personal appeal at the top of 700 million Wikipedia pages. What was this civilization like at it’s peak. Don’t worry, “James Altucher” will tell you. He has an appeal. Why did I want to promote myself? No reason. Just ego. Ask my therapist. I lacked loved as a child, blah blah blah. And I figured: they had Jimmy Wales up there. They had some programmer for Wikimedia. They had some random editor. They had the inventor of wikis. So why not me? My daughters use Wikipedia to cheat on their homework every day. And if I ever get sick and they figure out how to hook up the spinal cords to the head I might very well end up with one of these head transplants thanks to what I learned on Wikipedia (search on “Head Transplants”) Although, seriously, I use Wikipedia all day long. Just did a vanity search on my name there, for instance. So I started with the idea: get massive self-promotion. And then I took the next step: go straight to the top: I wrote Jimmy Wales with the subject: I can help. I needed to stand out. I came up with the most outlandish way in which $1 contributed to the Wikimedia foundation could help the planet. I imagined a future with Insta-Fi and no separation between our superficial consciousness (“the brain”) and the Internet. And what would Wikipedia look like then? Then I pitched it straight to Jimmy Wales. To my surprise, he wrote back write away. He was either being nice or just wanted to get rid of me. Probably both. But I like that he wrote back. I probably would not have done that if I were him. At the moment I have 146,355 unread emails in my inbox. On April 22, I wrote how I had 105,633 unread emails in my inbox. I’m such a bad responder. 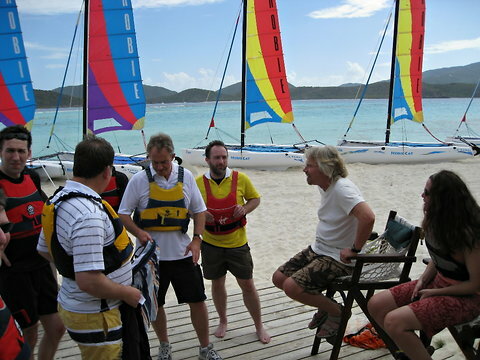 Once Wales wrote back, I had a fantasy about hanging out with him and Larry Page on Richard Branson’s yacht. That’s what we all do when we’re not writing emails to each other. (See, “Why are Larry Page and I So Different (or…why didn’t he buy my company”). “Zack, I’d very much like to make an appeal for the Wikimedia foundation. We wrote back and forth a few times after that. He asked what I had in mind. I suggested that since he had all these editors, inventors, etc make an appeal, why not have an appeal from his biggest user. ME! Finally, he called me out right on the spot (very politely) and narrowed down to the two issues that were really at stake here: who the hell am I, and, perhaps more crucially from his perspective, was I a seriously mentally ill patient or future patient. I’ll definitely consider it if you send us an appeal! But I think it might just be too random — in the sense that a lot of people would ask: Why him? Are they trying to promote him? We did do a reader/donor appeal this year — a software developer from a small city in India who left us a nice note when she donated. I’m afriad that most people would read it like wacky science fiction — and the Wikimedia fundraiser just isn’t the forum for changing people’s minds about what the future’s going to look like. Have you written about this sort of thing in your columns? Point me there and I’ll be able to see what language you’re using and think about whether it might fit in an appeal. “Two years ago there was the argument that Wikipedia was not as accurate as more traditional (text-based with editors) encyclopedias. That argument is over and Wikipedia won. One year ago there was the argument that the Internet was making us more stupid. The other day my nine year old daughter was explaining the evolution of different sea-based species that eventually evolved into humans. I asked her where she learned this information since I had no idea. She said, “I read it on Wikipedia”. So my nine year old made me smarter. Wikipedia made her smarter. And will continue to do so for the rest of her life. Let’s engage in a small fantasy that’s not so far-fetched. What will the argument be ten years from now? Perhaps twenty years from now? 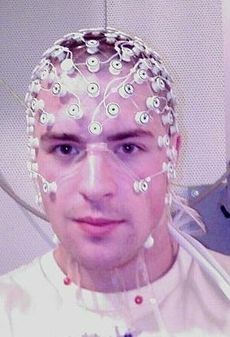 Science can already do non-invasive brain scans to determine what letter you are thinking. Science can already do non-invasive brain scans to allow quadriplegics to command exo-skeleton structures that allow them to perform basic functions they could not otherwise perform. That’s today. What’s tomorrow? A non-invasive way to make a thought query into Wikipedia via some wimax network. A response that gets communicated back to the brain. A way to receive through sight or sound or memory the answer to your request. Will $5 get there? Will $1 million? Of course not. This is the future. This is the future of our intelligence. This is the future of our evolution as ideas continue to mate rapidly, as generation after generation of humans seek to improve themselves. I may not be alive to see the results of this fantasy. But I bet my nine year old will be. And her eventual descendants. Will $5 get there? No. Damn, I thought for sure that would get me in the door. And note: I’m not fooling anyone. I believe what I wrote. But I was 100% doing it for self-promotional and ego purposes. But then today I arrived at Wikipedia and there was a note at the top from Sue Gardner, Executive Director of the Wikimedia foundation, thanking everyone on the planet because Wikimedia made their financial goals. So my dreams are dashed. I missed out on getting my appeal in there. This year. I failed. But a failure is only a failure if you don’t learn anything from it. Failure is ok. I tried. I learned something new in the process. Go direct for the decision makers so you don’t waste any time. Use your brain. I had to come up with an idea to make me stand out. Maybe it didn’t work this time but if I try 30 times in a row, something will stand out. Use your brain, part II. The idea muscle is like any other muscle. It needs exercise or it atrophies. Take out a waiter pad and a pen, go to your closest cafe, and come up with ten ideas that will make the world better one year from now. Even better: ten ideas you can do. Even better: ten ideas you can do with the tools available to you today, at your business, on your computer, whatever. Use your brain, part III. Like any exercise, you don’t get the “burn” unless you sweat. Sweat a little. You just made the list above. Now what are the ten next steps. List them. Now do it. Make sure you can execute on your ideas. Else they are bad ideas. Then do them TODAY. Then tomorrow, repeat. I’m onto my next thing. No harm. No foul. It didn’t take that much time. It forced me to exercise my brain in unusual ways. It forced me to exercise my networking muscle. And if my devious, world-dominating plan had worked, it would have had great results. For me. if not for the Wikimedia Foundation. If not the entire planet! Why do I want to promote myself? For no reason at all. Just for fun. But who can argue with that? Repurpose. I made a TechCrunch article out of it. BAM!